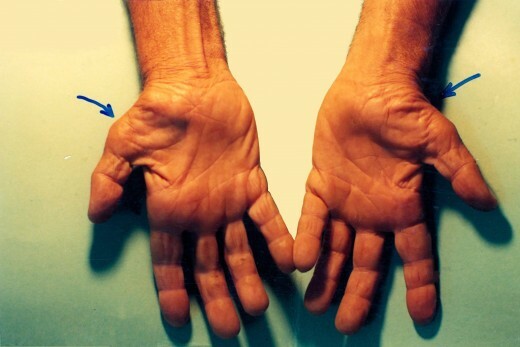 In the case of Carpal Tunnel Syndrome, there may be numbness and tingling sensation in the thumb, index and middle fingers in the areas of Median Nerve distribution areas. 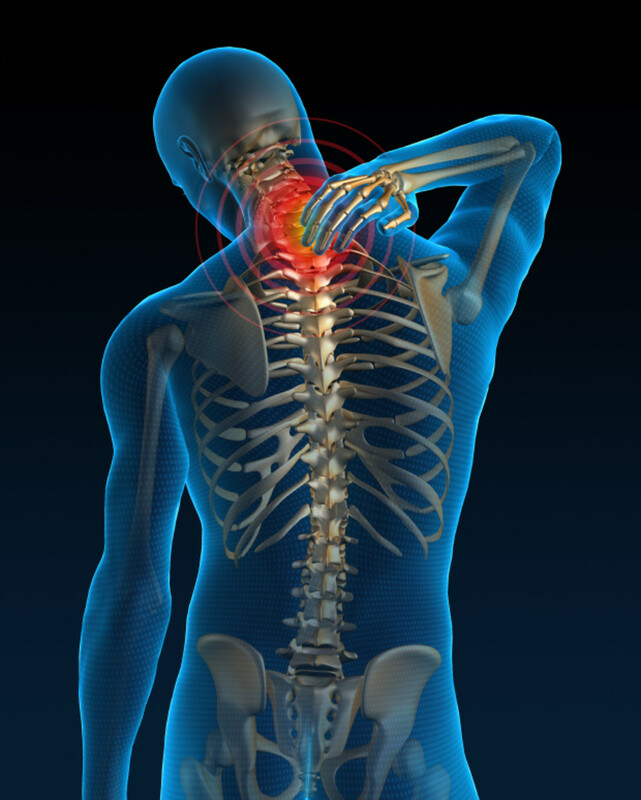 Moreover, there may be weakness and wasting of thenar muscles with sensory deficit in that area. In the long standing cases there may be inco-ordination of the hand and fingers. Hence the treatment for Carpal Tunnel Syndromealso aims at strengthening the thenar as well as the smaller muscles of the hand. 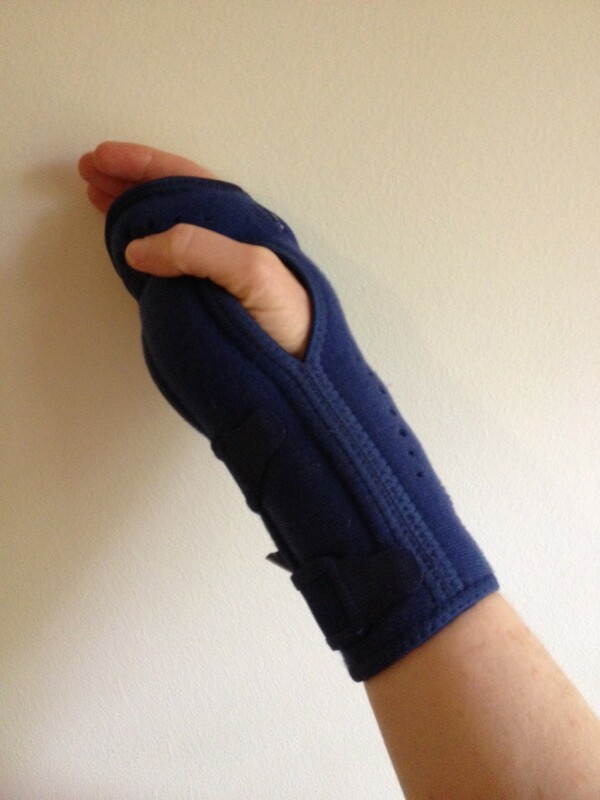 Let the patient have right Carpal Tunnel Syndrome. Starting Position- The patient sits in a chair near a table facing it. 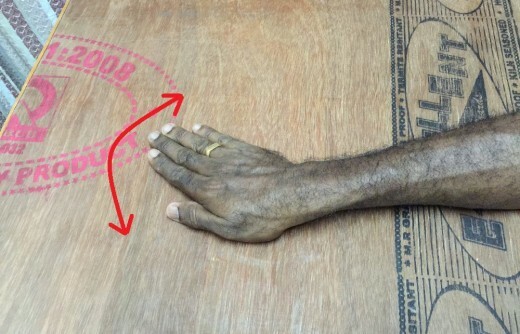 The patient keeps his bend right elbow on the table in such a way that the right elbow is flexed (bend) approximately to 45 degrees with the anterior aspect (front side) of the right forearm and the palmar aspect (front side) of the right hand facing upwards with the right wrist in the neutral position and the right fingers extended. Exercise- Touch the tip of the right little finger with the tip of the thumb as if ‘pinching’. Press each other for 2 seconds. Now relax and bring the little finger and the thumb back to the starting position. Repeat the same exercise with the other fingers in the order starting from the ring finger and ending up with the index finger. Repeat the same exercise in the reverse order starting from the index finger and ending up with the ring finger. Starting Position- The patient sits in a chair near a table facing it. 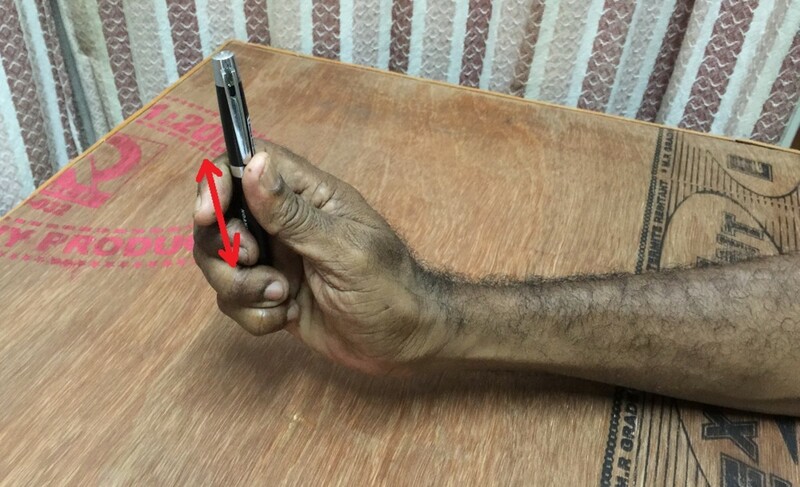 The patient keeps his bend right elbow on the table in such a way that the right elbow is flexed (bend) approximately to 45 degrees with the anterior aspect (front side) of the right forearm and the palmar aspect (front side) of the right hand facing upwards with the right wrist in the neutral position and the right fingers extended. Exercise-Touch the tip of the right little finger with the tip of the thumb as if ‘pinching’. 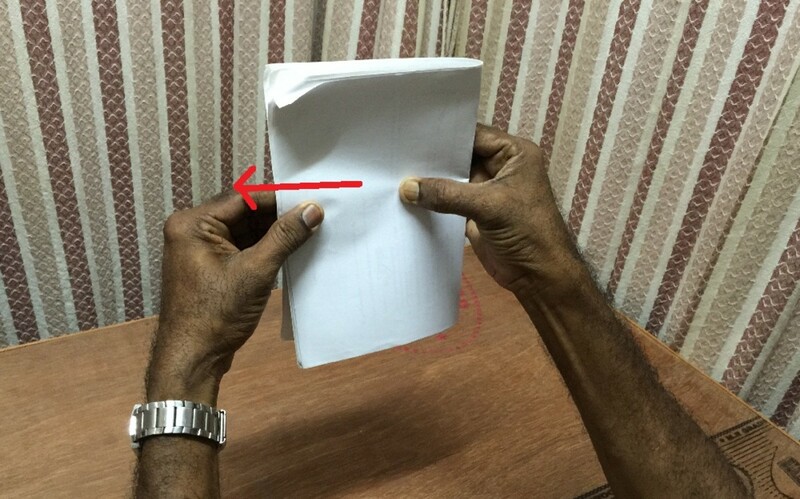 Place a piece of paper between the tips of the thumb and the little finger and hold the paper tightly. 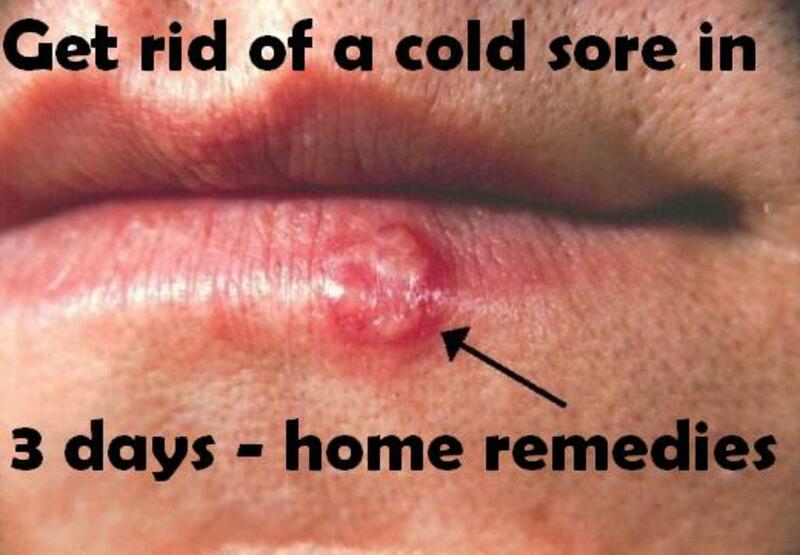 Now pull out the paper from the clutches of the thumb and the little finger. Repeat the same exercise with other fingers in the order starting from the ring finger and ending up with the index finger. Exercise- Touch the tip of the right little finger with the tip of the thumb as if ‘pinching’. 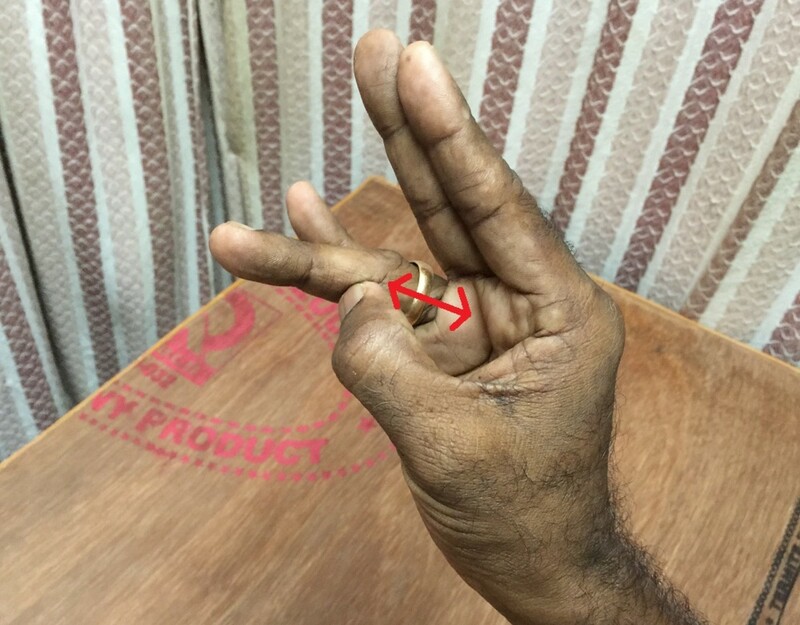 Slide the thumb down the little finger along its anterior aspect (front side). A slight pressure may be exerted by the thumb against the little finger along the course of the movement. 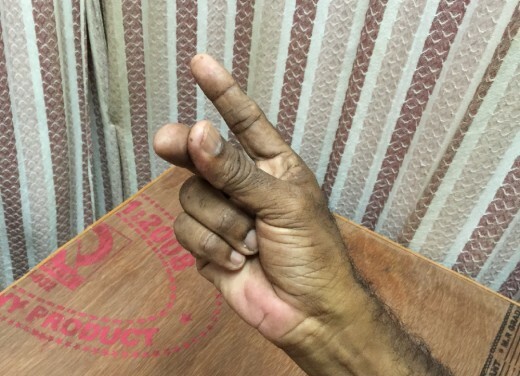 Once the tip of the thumb has reached the base of the little finger, reverse the movement by sliding the thumb up the little finger, thumb exerting a slight pressure against the little finger as it slides up. Repeat the exercise in the reverse order starting from the index finger and ending up with the ring finger. Exercise- Touch the tip of the right little finger with the tip of the thumb as if ‘pinching’. 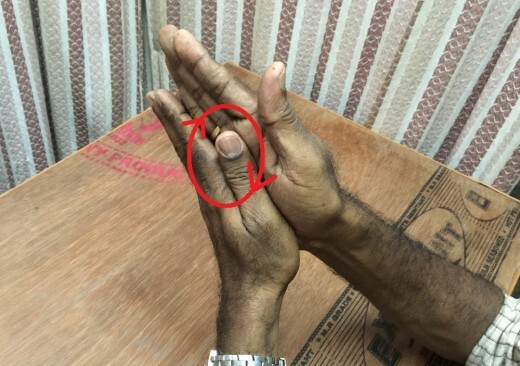 Make the thumb ‘flick’ on the little finger. Repeat the same exercise with the other fingers, in the order starting with the ring finger with the index finger. Starting Position- The patient sits on a chair near a table facing it. He keeps his right forearm and right hand on the table in such a way that the anterior aspect (front side) of the right forearm and the palmar aspect (front side) of the right hand lie flat on the table. Starting Position- The patient sits on a chair near a table facing it. 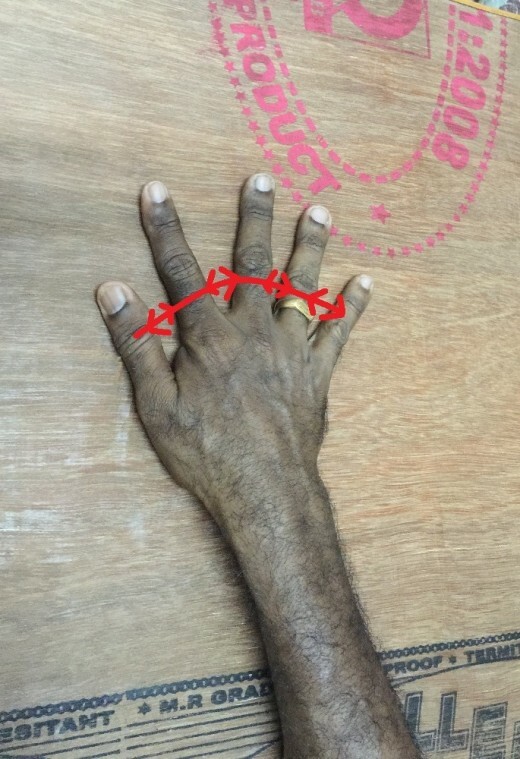 Exercise- The patient keeps his right forearm and right hand on the table in such a way that the anterior aspect (front side) of the right forearm and the palmar aspect (front side) of the right hand lie flat on the table. Lift the right hand up at the knuckles in such a way that the hand is formed into a ‘tent’ shape, with the fingers still touching the surface of the table (as shown in the figure). 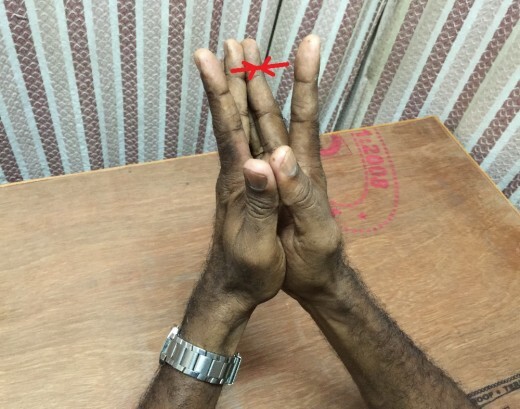 While doing this exercise, the fingers must be kept straight as far as possible. Return back to the starting position. 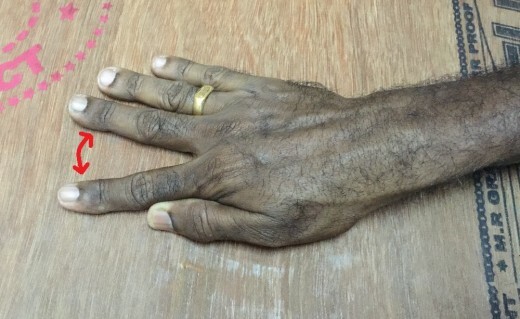 Exercise- The patient keeps his right forearm and right hand on the table in such a way that the anterior aspect (front side) of the right forearm and the palmar aspect (front side) of the right hand lie flat on the table. Lift the thumb and the fingers up individually (one at a time) and tap them on the table individually (one at a time) as if typewriter buttons are pressed in the order starting from the thumb and ending up with the little finger. 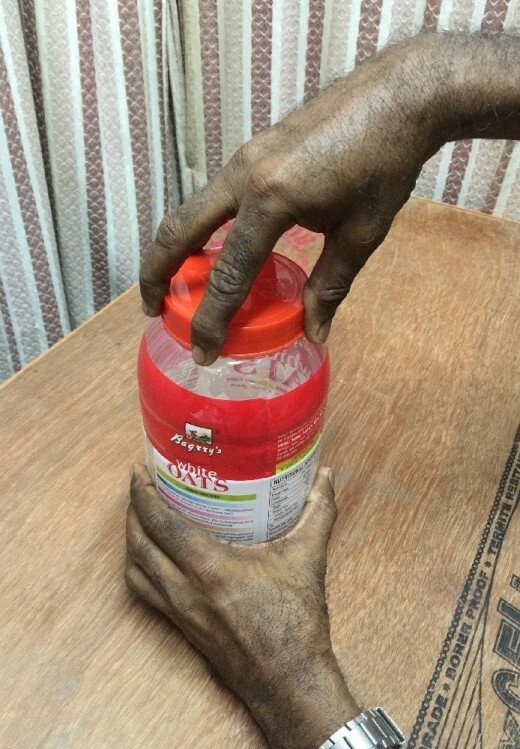 The fingers are tapped with certain amount of force or pressure. The exercise may be repeated in the reverse order starting from the little finger and ending up with the thumb. 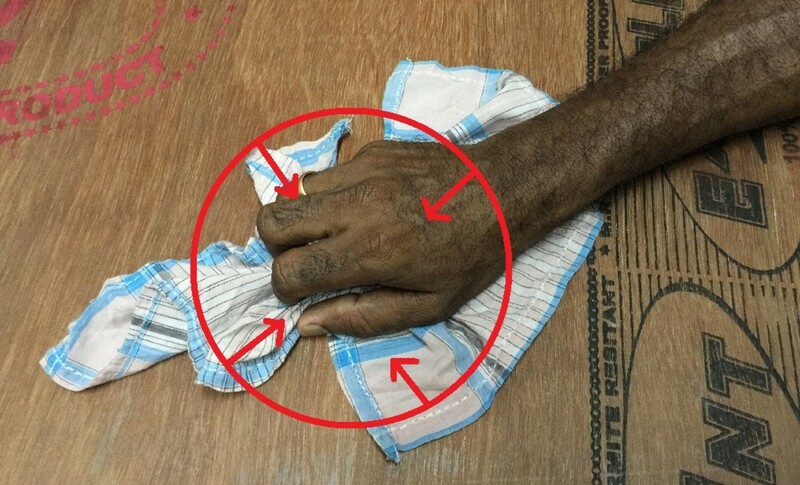 Exercise- The patient keeps his right forearm and right hand on the table in such a way that the anterior aspect (front side) of the right forearm and the palmar aspect (front side) of the right hand lie flat on the table. 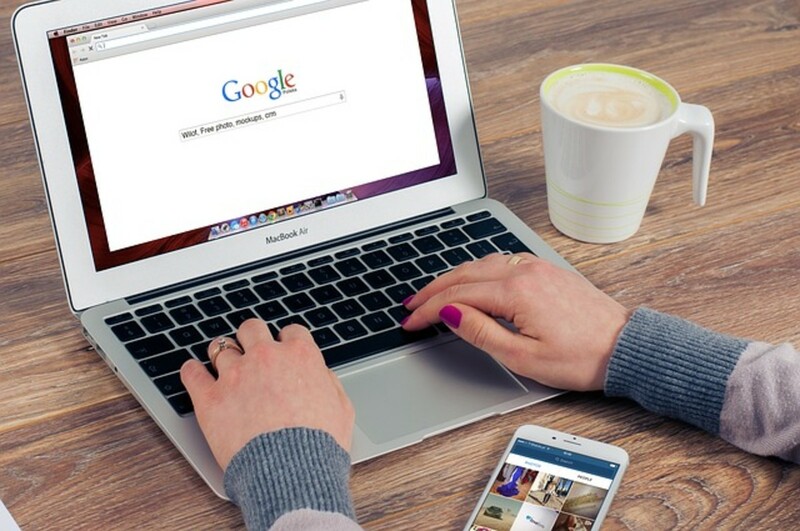 To start with move the index finger sideways away from the middle finger (sliding the index finger along the surface of the table), keeping the fingers straight. Now bring them back to the starting position. 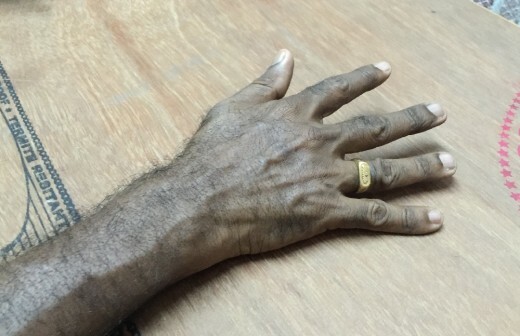 Now move the ring finger sideways away from the middle finger (sliding the ring finger along the surface of the table), keeping the fingers straight. Bring them back to the starting position. Now move the little finger sideways away from the ring finger (sliding the little finger along the surface of the table), keeping the fingers straight. Bring them back to the starting position. 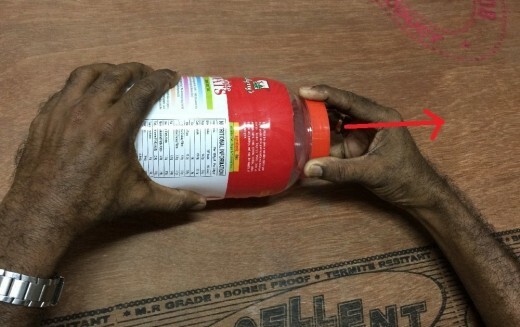 Use the other hand to help to move the fingers until they get a ‘feel’ for it. Once the patient gets a ‘feel’ of the exercise, a mild or moderate resistance may be given against the movements by the other hand. Exercise- The patient keeps his bend right elbow on the table in such a way that the right elbow is flexed (bend) approximately to 45 degrees with the anterior aspect (front side) of the right forearm and the palmar aspect of the right hand facing upwards with the right wrist in the neutral position and the fingers held extended. Make a tight ‘fist’ with the thumb inside the ‘fist’ (right).Now stretch out the fingers widely. 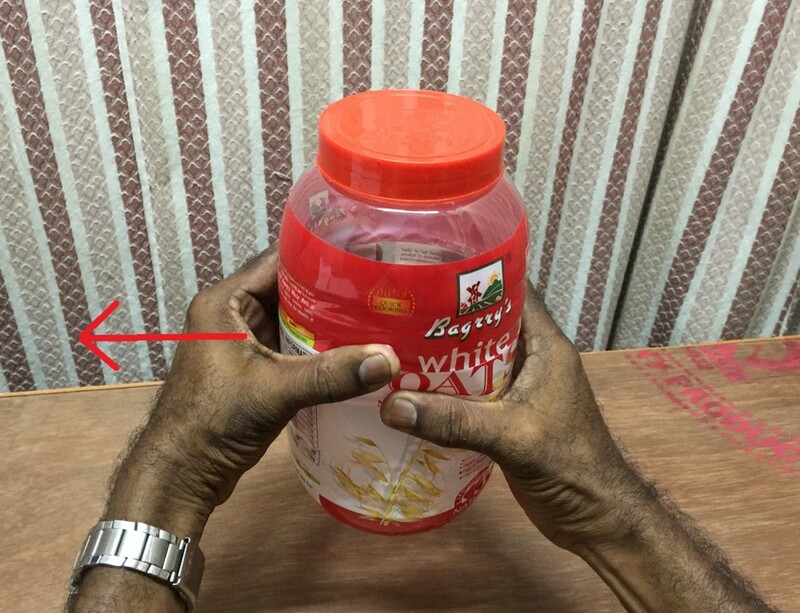 Make a tight ‘fist’ with the thumb outside the ‘fist’ (right). Now stretch out the fingers widely. Make a tight ‘fist’ with the thumb inside or outside the ‘fist’ (right). 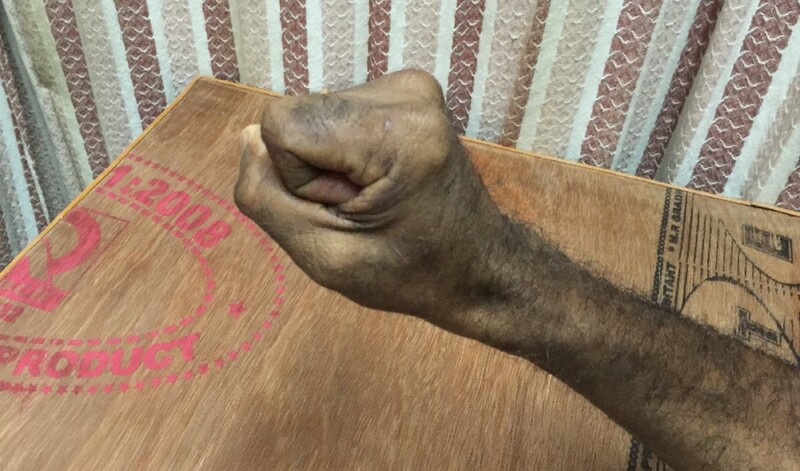 Hold the (right) ‘fist’ with the left hand in such a way that it wraps round the ‘fist’ (right). Now stretch out the right fingers to which a mild or moderate resistance is offered by the left hand. Starting Position- The patient sits on a chair near a table facing it. Exercise- The patient keeps his bend both elbows on the table in such a way that both the elbows are flexed (bend) approximately to 45 degrees with the anterior surfaces (front side) of both forearms and the palmar aspects of both the hands facing each other with the wrists in the neutral position and the fingers held extended. The forearms and the hands are held closer and parallel to each other in such a way that the palmar aspects of both the hands are in close contact with each other. Press the palmar aspects of the hands against each other and move them in circles in the clockwise and then in the anticlockwise directions against each other. 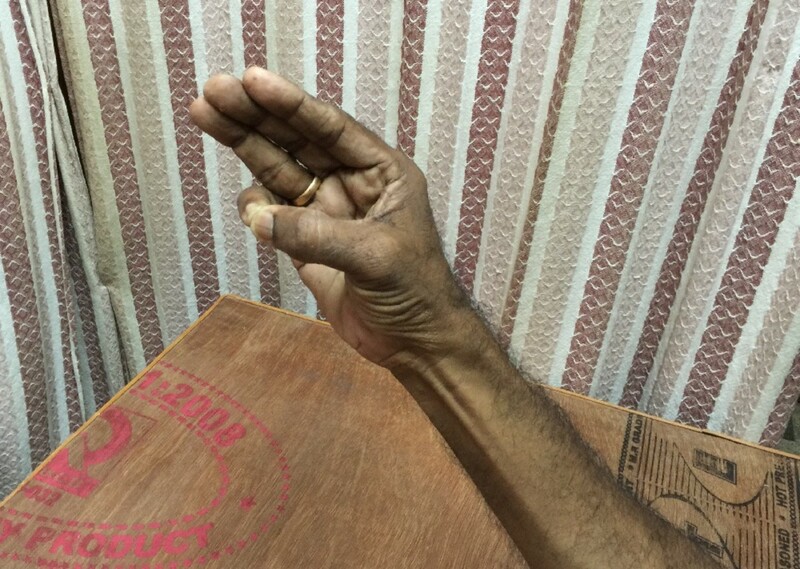 Exercise- The patient keeps his both bend elbows on the table in such a way that both the elbows are flexed (bend) approximately to 45 degrees with the anterior surfaces (front side) of both the forearms and the palmar aspects of both the hands facing each other with the wrists in the neutral position and the fingers held extended. The forearms and the hands are held closer and parallel to each other in such a way that the palmar aspects of both the hands are in close contact with each other so that the fingers of both the hands lie parallel to each other and in contact with the corresponding finger of the other hand. Press the palmar aspects of both the hands against each other. Separate the thumbs and stretch them out to the maximum while the palmar aspects of both the hands and the rest of the fingers of both hands are still in contact. Repeat the same exercise with other fingers in the order starting from the index finger and ending up with the little finger. Repeat the same exercise in the reverse order starting from the little finger and ending up with the thumbs. Starting Position- The patient sits in a chair near a table facing it. Exercise- The patient holds a pencil in the right hand in a correct tripod grip between the thumb, the index and the middle fingers, the anterior aspect of the right forearm and the right wrist resting on the table. 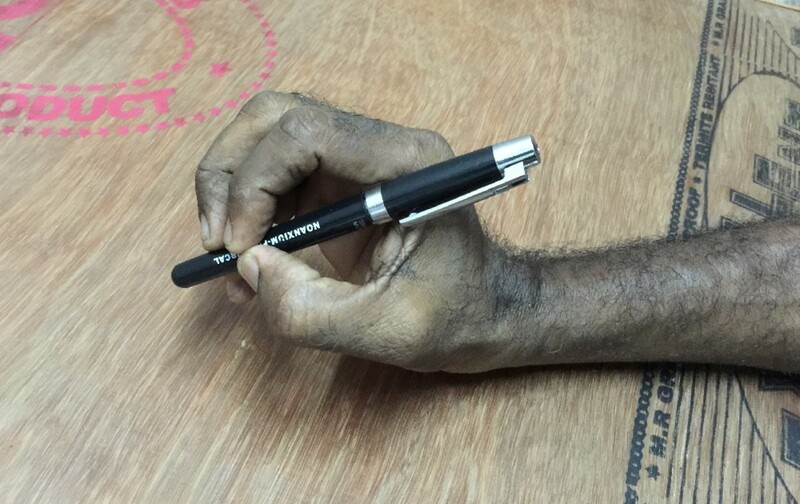 Make small circles on a paper placed on the table with only the fingers moving to make the pencil move, the wrist remaining stuck to the paper without moving throughout the exercise. Starting Position- The patient sits in a chair near a table facing it. 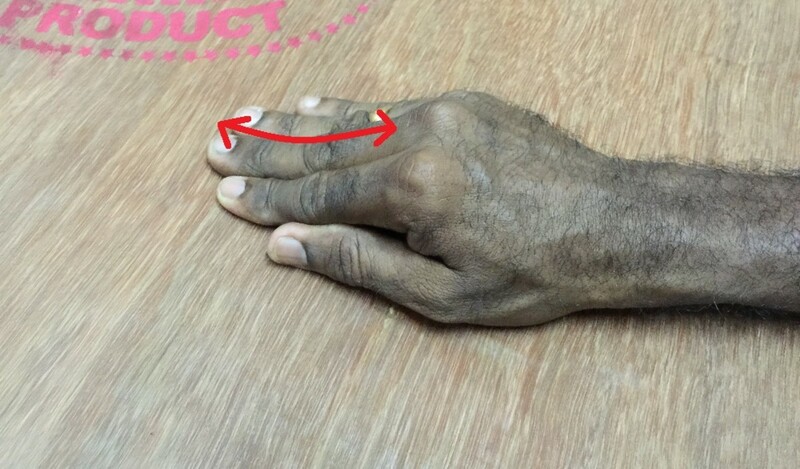 Exercise- The patient holds a pencil in the right hand in a correct tripod grip between the thumb, the index and the middle fingers, the anterior aspect of the right forearm and the right wrist resting on the table. Bend the thumb, the index and the middle fingers, with the grip on the pencil intact, in such a way that the pencil is pulled towards palm. Once the pencil is pulled in to the maximum the thumb, the index and middle fingers are straightened, with the grip on the pencil still intact, in such a way that the pencil is pushed out. Exercise- Spread out an hand kerchief on the table. 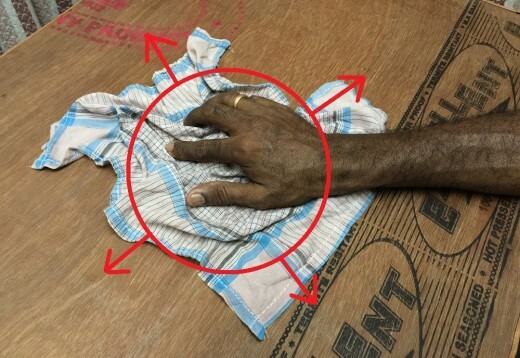 Keep the palmar aspect of the right hand on the spread out hand kerchief in such a way that the heel of the right hand rests at the middle of the handkerchief. Now pull the hand kerchief towards the palm of the hand with the fingers individually and finally with the fingers together, with the heel of the right hand still resting at the middle of the hand kerchief. This is continued till the whole hand kerchief is within the palm of the right hand. Now spread out the hand kerchief which is within the palm with the fingers individually and finally with the fingers together, with the heel of the right hand still resting at the middle of the hand kerchief. This is continued till the whole hand kerchief is spread out. Squeezing the ball Exercise- Take a small exercise ball (available in the market) and squeeze it several times. 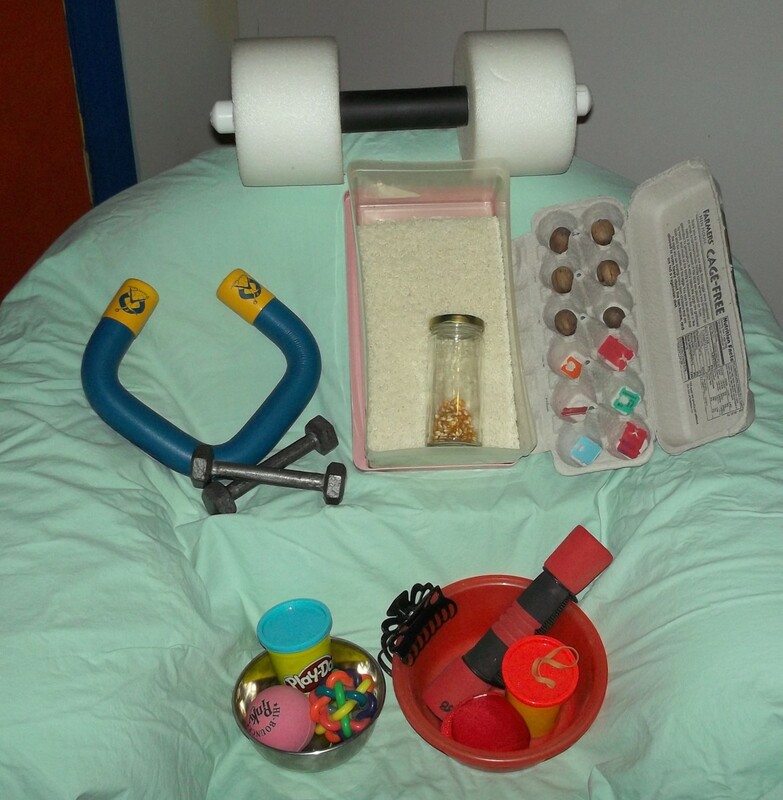 If the exercise ball is not available, a small ordinary ball may be used. Exercise- No.21. 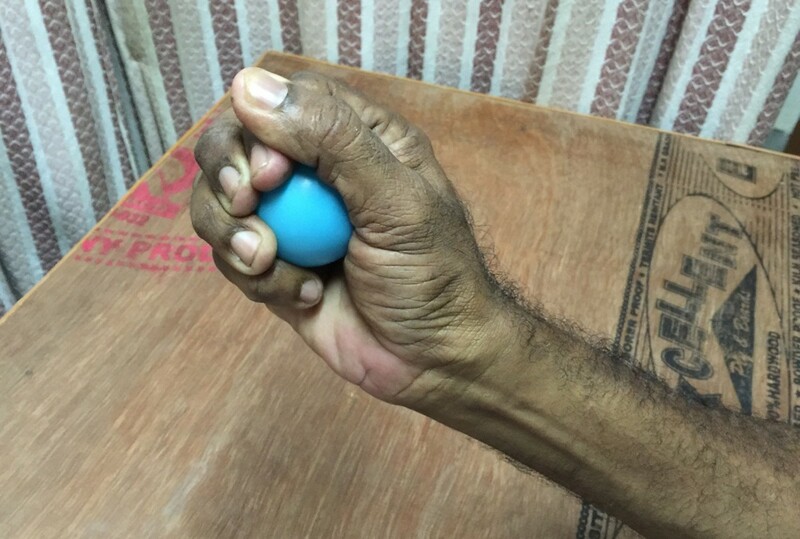 Grip Exercise. No.3. Starting Position- The patient sits in a chair near a table facing. 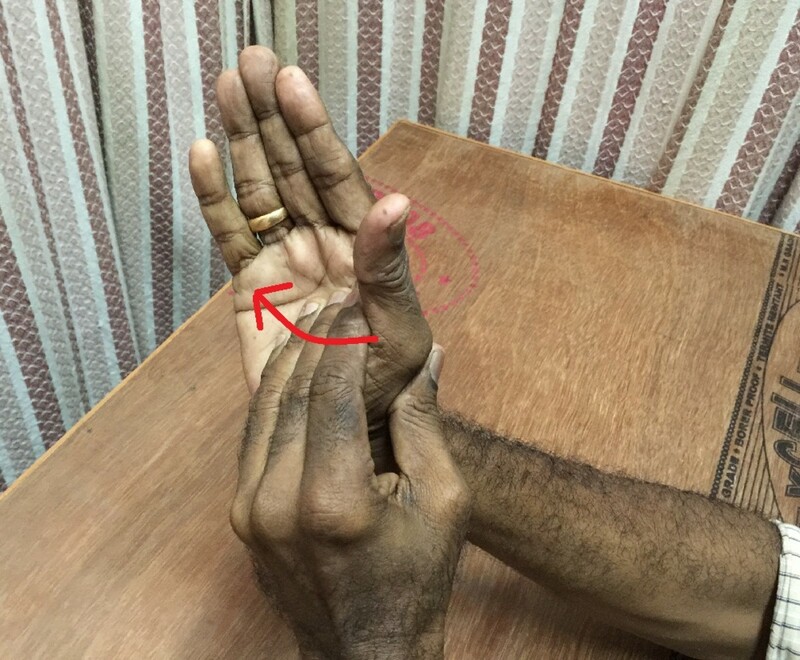 The patient keeps his bend right elbow on the table in such a way that the elbow is flexed (bend) approximately to 45 degrees with the ulnar border (inner side) of the right forearm and the right hand facing downwards with the right wrist and the fingers extended.